Several years ago, I finally began to understand how my dogs think. The most compelling example of this occurred one evening during a time I was having difficulty housebreaking our youngest dog, Little One. We adopted her at four months of age so she never had any racing training; in fact, she had had no training at all. Always finding Little One’s puddles after the fact, I had done what all training books say not to: I scolded her anyway out of my own frustration. One evening while tending plants, I spilled a bit of water on the floor. Little One came to me at just that moment for some love. She spied the water, looked up at me, and fled. I suddenly saw in one of those serendipitous experiences we humans only occasionally have just how my Little One thinks. The Pavlovian connection had been made: “Bells ring, I salivate; water on the floor, I get scolded.” The cause-effect aspect of the problem was lost on her. She was not aware that making the water was wrong; only that its presence on my floor — no matter where it came from — meant punishment for her. To her, creating the water and its presence on the floor were two discrete activities. The only time to effectively correct a dog who is soiling your house is to catch it in the act. This notion, as well as some other things I’ve observed in my dogs, has helped me understand a little about how they think. Dogs exist almost entirely in the present, an exclusive present which is very alien to us. They can determine only the simplest forms of cause and effect; there is no “If this …, then that…”, or as my husband is fond of saying, “They’re not much into planning ahead.” Humans cannot help but think ahead and back, and discover relationships between various aspects of our reality. Humans learn very early how a thing that happens at 8:00 a.m. (neglecting to make our bed) will cause a negative reaction at 10:00 a.m. (mommy checks to see how well we’ve done our daily chores). Dogs do not. For this reason, dogs require only an initial correction. Punishing after the fact or continuing punishment for any length of time is only confusing. Dogs’ very present sense of the world associates correction with whatever they are doing at the moment. If they are doing nothing wrong, we are teaching them that punishment is given arbitrarily and whimsically, not in response to a specific behavior. So, correct, go about your business, and within a short time, resume your normal, day-to-day relationship with your greyhound. A happy Rudy Grieves with his thinking cap on. Predictable behavior is instinctive in our domestic dogs too. We’ve noticed that our dogs, all five, follow the daily routine whether we do or not. For example, whether or not we are ready to go up to bed at 11:00 p.m., our dogs queue up at the gate to the family room door, nose to tail, waiting for us to turn off the TV and turn in for the night. If we don’t go at once, they pace and become agitated and restless until we do. Once upstairs in our room, to keep order, each has his or her own bed, a habit we have instilled in them so they do not keep us up all night playing musical beds. But, they too are most comfy in their own spots and each goes to his or her own place readily every night. Regularity is the key to their happiness — what is regular means predictability and security. There’s a lesson here about boarding. If you can find a reliable and affordable house/pet sitter, your pets will be happier and better off at home in their own environment and on their own routine while you are away. If you’ve lived with a dog for anytime, you know some ways that they communicate — tail wagging, barking, and crying. However, I’ve observed that greyhounds communicate with more subtle signals as well. Typically, I see friends’ dogs go to the door and bark or scratch if they want to go out. At the very least, they go to the door and point. My greyhounds offer much less obvious clues to their desires. I frequently mistook their gentle presence near me as a sign that they wanted petting, only to hear within a few minutes the familiar sound of running water in the next room. One must watch closely for greyhound signals. My oldest moves her eyes side to side in the direction of the backyard when she needs to go out; with her I must make eye contact to know what she wants. My male stands close and knits his brow into a look of real consternation. Neither of these dogs makes any noise at all. My brindle pants anxiously when she needs to go out. And all dogs, including greyhounds, are always watching us; but they watch so unobtrusively that humans rarely notice. This habit goes back to pack mentality — follow the lead of the alpha dog. If we’re alpha, it’s our lead they must follow. I have observed that my dogs always know when I am finished dressing in the morning and, therefore, when it is time to go downstairs. I wondered how they always arose and headed for the bedroom door at the correct moment. I finally realized that they watch how many passes I make in and out of the closet and the bathroom and only arise when I leave the bathroom for the last time. How do they know it is the last time? I flick the bathroom light switch off on my way out. This next observation may seem nuts, but I believe dogs can read the expressions on our face and detect a deceit. It may be that there is also a scent, a look around the eyes or in the corners of the mouth. I’m not sure. But mine know if I am laughing with them or at them. If I laugh at them, they stay where they are, crouch, and put their ears back. When I laugh with love rather than ridicule, even if the laughter is at their expense, they know it and come for love, tail wagging and ears up. I have come into a room in silence, smiled at my big, soft male, and he has come from my husband’s caresses to greet me without my uttering a word. And I have seen and heard countless stories of new owners who did all the right things, used the right tone of voice and the right gestures to acclimate a new dog to their household, but failed miserably until their own nerves at the newness of it wore off. Since they look to us to provide alpha security, dogs respond negatively to our anxiety, and we can’t hide it. Dogs know what we’re thinking based on subtle facial expressions, as well as our scent and touch. I am no animal behaviorist, to be sure. 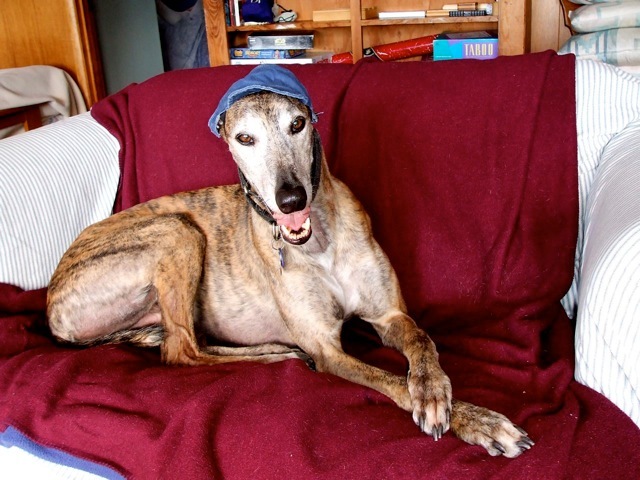 These are stories based merely on my twelve years of greyhound ownership, my experience at the kennel of an adoption group for greyhounds where I do volunteer work, and some casual reading. But there are lots of great books by professionals on Greyhounds and training. Of course, there is the greyhound adopter’s Bible, Adopting the Racing Greyhound by Cynthia Branigan. 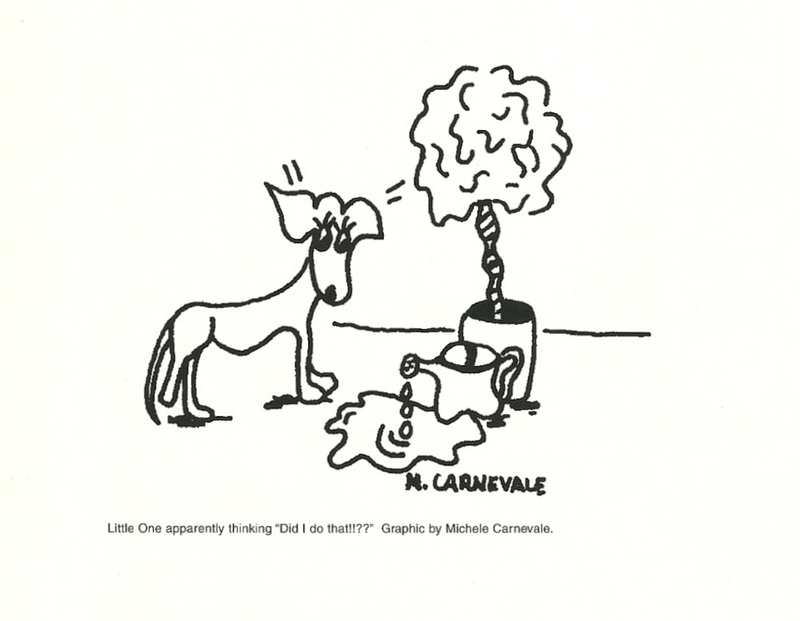 Some other sources I would recommend are Patricia Gail Burnham’s book PlayTraining Your Dog, Caroline Coile’s Greyhounds: A Complete Owner’s Manual, and Your Dog, the newsletter published by the Tufts Veterinary school. This last one is the best of its kind that I’ve seen. Still, the real fun of dog ownership is learning together with your pet. I’m convinced that owners’ observations can reveal a lot about their pets. If you really watch your dog and see the world through its eyes, you will discover a faithful, loving companion.